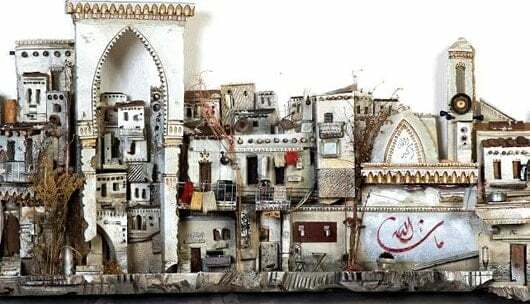 Artist and architect Mohamad Hafez creates sculptures representing Middle Eastern streetscapes and buildings besieged by civil war, deliberately contrasted with verses from the Holy Quran. His work reflects the political turmoil in the Middle East through the compilation of found objects, paint, and scrap metal in miniaturized installations that are architectural in their appearance, yet politically charged in their content. A Syrian artist and architect, Mohamad Hafez was born in Damascus, raised in the Kingdom of Saudi Arabia, educated in the Midwestern United States, and now lives in New Haven. Expressing the juxtaposition of East and West within him, Hafez’s art reflects the political turmoil in the Middle East through the compilation of found objects, paint and scrap metal. Using his architectural skills, Hafez creates surrealistic Middle Eastern streetscapes that are architectural in their appearance yet politically charged in their content. Hafez’s recent work depicts cities besieged by civil war to capture the magnitude of the devastation and to expose the fragility of human life. Hafez’s work reflects his deep interest in the cross-disciplinary exploration of street art and the realistic, yet ironic sculptural work. Closing Event with Artist talk and discussion, Sunday, April 24, 3 PM.